Having been directly involved with the recruitment industry in Pittsburgh for the past dozen years or so, speaking with literally thousands of human resource professionals, business owners and department heads across the region, we are seeing this year shaping up to be the most unusual in trending that we have encountered. After having maintained a relatively healthy level of recruitment activity through most of 2008 (until 4th quarter) we, along with the rest of the country, plummeted in ad count during first quarter of 2009. Beginning just after our job fair at Mellon Arena in late March, however, the precipitous drop in activity leveled out in April giving hope that May and June might see a reversal and show some improvement. Seasonally, spring and fall are the biggest hiring periods (and thus, highest ad counts) of the year. Unfortunately (or fortunately depending on how you look at it) recruitment activity remained flat through April. May came and went and then June and July. Mid summer and mid winter have always trended as the weakest recruitment periods in the past but recruitment activity this summer did not rise or fall to any significant amount. August is now about over and levels still remain flat from July. Hiring managers appear to be holding their collective breaths waiting to see what the near term economy will bring. As has been widely publicized over the past year, healthcare and education related fields show the greatest strengths in terms of activity in the Pittsburgh region. Other areas that have shown some strength are food prep/hospitality, social services, protective services and technician/maintenance (including automotive technicians). Nationally the job market is projected to remain in decline through at least mid 2010. While Pittsburgh has enjoyed one of the strongest job markets in the country through the past year and a half, the best we can hope for going into September is that we are “less worse” than August. If seasonal hiring trends once again begin to approach typical form, we could see a fall hiring season that shows some job growth in our region. That is a big “if”. The “Putting America Back to Work” job fair series, with over 50 events scheduled to be held across the country, returns to Pittsburgh on August 4th at Mellon Arena (home of the Stanley Cup Champion Pittsburgh Penguins!) from 10AM to 3PM. The March event, which was also held at Mellon Arena, featured 45 companies and schools and was attended by approximately 1,500 job seekers. One aspect of this series across the country is the post event tracking of how many job offers are made to the job seekers who attended each event. The goal was 10,000 jobs by 2010. As of the end of June that goal was already achieved! The new goal has now been put at 15,000 job offers nationwide. The Pittsburgh event in March has resulted so far in over 150 job offers made giving those in attendance a better than 1 in 10 chance of landing a job. The upcoming August event is expected to be somewhat smaller in size due to the seasonal aspect of an early August job market. About 35 employers and schools are expected to attend. The doors will open to the public at 10:00AM with free admission for all job seekers and no pre-registration required. 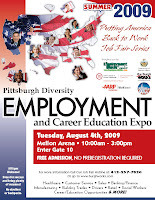 This event, the 2009 Pittsburgh Diversity Employment and Career Education Expo, is produced by the Pittsburgh office of EmploymentGuide.com, The Urban League of Greater Pittsburgh, AARP Foundation WorkSearch and Allegheny Department of Veteran’s Affairs. Representatives from each of those organizations will be on hand to speak with job seekers about programs offered to help with job searches in this difficult economy.